The best way to determine if we can help you is a live one-on-one CRM demo (Just you and your team and highly qualified business analyst). The CRM Demo’s are conducted via the internet using Goto Meeting and can take 30 to 60 minutes; depending on how excited your get. We tailor our CRM demos to your business – it is not a canned presentation, its more of a consultation and you’ll get the opportunity to discuss your particular requirements and see if we can help you. In the form below you have an opportunity to provide us with more details so our CRM demo can be even better. You tell us about what you need, your pain-points in your business, the automations or customisations you may require. We tell you about how we can use our software or our expertise in solving or matching your requirements. Equally if we can’t, we’ll say so. We will show you around the system and where possible, even start configuring it to your needs as a way of showing you that we can help you. Just because we do the initial demo over the web doesn’t mean we don’t come to you. We have customers all over the Australia and NZ in some of the remotest of places. Please note that our website / videos do not cover the full range of functionality or real world application of this system. Tall Emu CRM is much much more than a normal CRM and we’ve implemented in 1000’s of different businesses and for most industries. 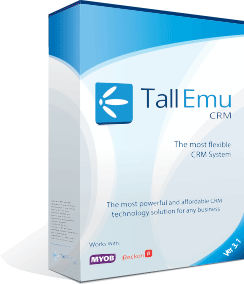 Tall Emu CRM is especially suited to very niche industries, manufacturing, high volume, fast growing business that need our brains as well as the software. Get your CRM Demo today! !